Sulzer's new HSR turbocompressors contain no oil or other liquid lubricant. 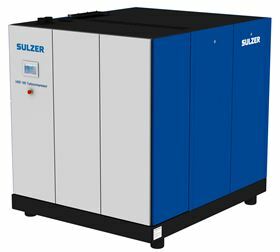 Sulzer has announced the launch of its new HSR line of high-speed turbocompressors, designed to produce oil-free pressurised air in applications where air contamination must be avoided. The HSR contains no oil at all which means it produces safe, contamination-free compressed air for processes such as the production of fibrous materials, the manufacturing of pharmaceutical products and in the food and beverage industries. The design includes the use of active magnetic bearings which results in no mechanical friction or wear and an almost total absence of vibration. The direct drive and magnetic bearings mean there is no need for mechanical gears, bearings and seals. There is no oil or other liquid lubricant anywhere in the product. There are no wearing parts to be replaced, no oil to be refilled and no consumables to be disposed. The HSR is cooled by water and so both the heat generated by the compression and drive-related losses can be recovered as usable energy. The two-stage or three-stage compression for maximum pressures of 4.5 and 9 bar (gauge) respectively is done with turbo air ends, directly driven by a high-speed motor that uses permanent magnets.